Project INSIGHT is one of 8 projects awarded a total of £20 million in funding from the government’s £100 million Intelligent Mobility Fund. 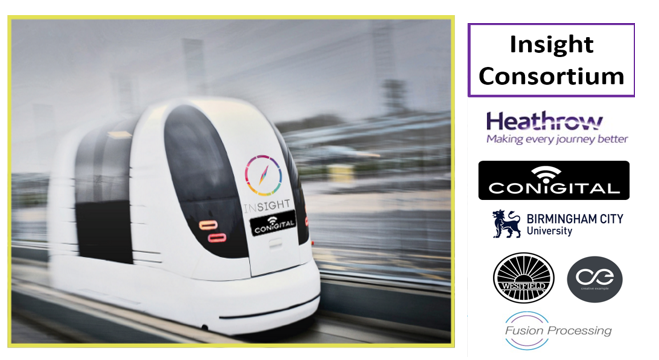 They range from developing autonomous shuttles to carry visually-impaired passengers using advanced sensors and control systems, to new simulation trials for autonomous pods to increase uptake and improve real-world trials. INSIGHT aims to cut congestion, lower emissions and improve transport access for people that are blind, visually impaired or have problems with mobility. The project will see two of the hi-tech shuttles arrive in the region from next year which will be tested over the course of a pilot period. INSIGHT will focus on improving the accessibility of transport for people who have difficulty travelling independently, as well as on the safety, reliability and integration of autonomous vehicles into an urban environment. The funding will help strengthen the UK as a global centre for the fast-growing intelligent mobility market, estimated to be worth £900 billion per year globally by 2025. The cars will be built by modifying existing Heathrow Ultra-pod vehicles to incorporate state-of-the-art 3D imaging and innovative sensors for navigation and safety of not only the passengers but also pedestrians, road users and other vehicles. The vehicles will feature the world’s first four-dimensional tactile display which will provide continuous sensory feedback for blind users over the course of their journeys. Advanced indoor and outdoor positioning systems will allow blind users to know their exact locations using a smartphone app and will link to a cloud-based system which will allow nearby vehicles to be virtually requested or ‘hailed’.